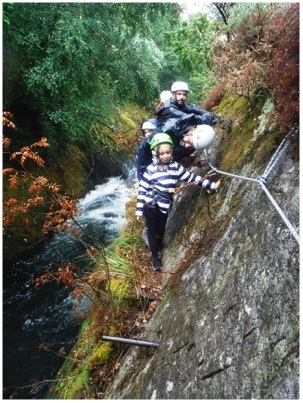 We have a variety of locations where we can run this activity so it is rare that we cannot run it, its great to combine with coasteering or gorge scrambling or just as an acitivty in the colder months when you don'tt want to get wet. WHAT IS TYROLEANS, ZIPS & CLIP LINES? Incorporate some rope adventure into your day with a day of tyroleans, zip lines and clip lines. 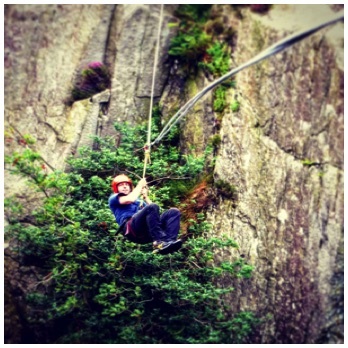 Tyroleans are ropes that you go horizontally across a gap - feeling lots of space below your feet. Zip lines you ride down a rope across a gap, again feeling space below your feet but with a bit of speed too. Clip lines allow you to climb along a section of rock feeling the exhileration of climbing but normally going sideways traversing. Where your adventure happens depends on the weather but it can be by the sea, in a gorge or over waterfalls.